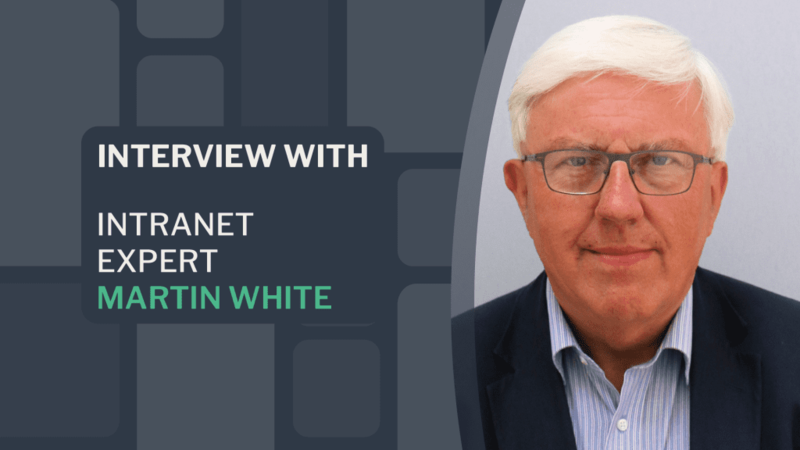 Martin White, Managing Director, Intranet Focus Ltd., is an intranet, enterprise search and information management strategy consultant, founding Intranet Focus Ltd in 1999. An information scientist by profession, he has been a Visiting Professor at the Information School, the University of Sheffield, since 2002. Martin has written books on information consultancy, the selection of content management software, intranet management and managing enterprise search applications. You’re the founder and Managing Director of Intranet Focus, can you tell me how this came about? At the time I setup Intranet Focus, I had two main strings to my career, electronic publishing and intranet technology, however, I did not have a computing background. At the time I decided to set up Intranet Focus I had a background in electronic publishing and in IT strategy. In 1998 I was working for a small knowledge management consultancy in London. A client had asked for advice on how to improve the flow of information and knowledge around its global network of offices. Intranets really started to take off in 1996 and so we recommended that this was the technology to adopt. For various reasons, they chose not to, but from the project, I realised that intranets were a combination of electronic published and IT strategy and there could be good consulting opportunities. As an intranet expert, what do you think makes a great intranet? Two words – great content. If the content is consistently high quality and helps people do their job better, they’ll find it. I am more sceptical about how pretty an intranet looks or what name you give it. In the end, it doesn’t matter. If the information cannot be relied upon, no one will use it, no matter how pretty it looks. We often lose track of content quality and focus on quantity. It seems people ask ‘how much can we stick on the intranet?’ This particularly applies to news. Many intranets focus too heavily on news which is often only relevant to a few people around the organisation. And yet, for some reason, the attitude is ‘we must get news out’. What do you find are the most common mistakes made by intranet providers and/or by Intranet Managers? I think there are two. We focus too heavily on individual tasks that can be done on the intranet. How can we get meeting rooms booked? How can we book our vacation days? I think this focus on tasks is not helpful. I prefer to focus on decisions, because in the end, we make decisions all day long even when we don’t consciously realise it. It’s not very often that a decision requires just one task. The problem is, we think if we deliver on a certain task we’ve built a great intranet. But, this isn’t the case because people need to make decisions and often decisions are often the result of multiple tasks. 2. Search is often totally ignored. We are so fixated on information architecture. What fits where? How can we build a better hierarchy? But, search, browse and alerts all have a role to play. For example, we’ve been alerted to the start of a project, now I want to find all the back material related to the project and I also want to browse through an alphabetical list of older, related projects. Without good search functionality, I cannot achieve any of this. The problem is, intranets are often designed by people with a web background and they focus highly on architecture whilst search is often left out of the overall strategy. It tends to be as long as there’s a search box and users can type a word in, everything will be fine. What are your thoughts about the future of digital workplaces? First thing is, in the context we’re speaking about, there’s no such thing as a digital workplace. My point is, if you think about it, we are already working in digital workplaces. I’ve been working in a digital workplace since 1986 when I had my first computer sitting on my desk. It’s not something you can put edges around and say we’re going to prepare a strategy. It’s too late as we’ve already got one. There’s social media, instant messaging, smart phones. The future of digital workplaces is being compromised as people are trying to define it as one piece of technology rather than thinking of the way we can use technology to support the way we work. When I started out on my career, Business Analysts and Operations Analysts understood how people did their jobs. Nowadays, we don’t tend to care or ask the questions, what do you need throughout your working day and where do you get it from? It’s about information seeking, not just information search, which is just one way of seeking, not the only way. We are too often defining digital workplaces by a technology stack rather than an employee experience. We didn’t say we had a ‘fax workplace’ when fax came along. What I really like is the move towards focusing on what is the digital employee experience? Rather than, what can we offer them as a digital workplace? What’s the vision for the next five years? I started off in intranets in 1999. My first big project was in 2001 for the International Monetary Fund in Washington DC – we started the day before 9/11! One of the things I learned from that project was how important search was for an intranet. Over the last 20 years that I’ve been in business, gradually, the balance of my work has somewhat changed from intranet strategy to search strategy. We’ve been working on search since about 1965 and still can’t do it properly. So, my vision is to continue to raise the importance of effective search and achieving search satisfaction wherever it’s used. This could be on a website, e-commerce, intranet or wherever.